The North Island is rich in natural resources to support wind, microhydro and run-of-the-river, tidal and biomass as potential sources of clean energy. Vancouver Island currently produces 500MW of the 2300MW that it consumes. 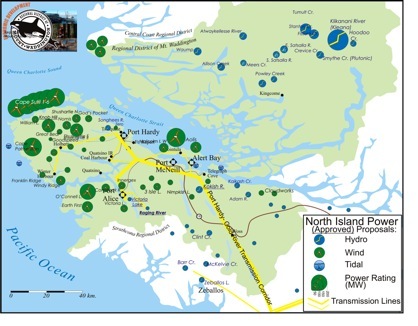 The energy estimates of the current proposed projects on Vancouver Island are around 4200MW. To date, the BC transmission corporation has identified 1800MW of green energy products as economically and environmentally feasible. With advancements in technology and infrastructure, the North Island alone could supply all of Vancouver Island’s energy needs. Many more potential projects will become viable when capacity obstacles are eliminated with a transmission system upgrade. There are also operating changes that can be made to maximize capacity. The map to the right shows power projects which have already been approved and are currently under development.